The CHS Corporate Guardianship Program provides advocacy services on behalf of more than 100 individuals with intellectual, developmental and related disabilities living throughout the Commonwealth of Massachusetts. Through this program, CHS provides legal guardianship for people who require additional levels of assistance, advocacy, and protections to assure that their desires, wishes and needs are respected, addressed and met. Our guardianship services are based upon seeking the least restrictive level of guardianship to ensure that the person served retains as much personal control as possible. The Guardianship Program provides both permanent and temporary guardianship services, ranging from partial guardianship (i.e. medical, financial, Roger’s Monitoring, etc) to full guardianship. Most CHS Guardians work on a part-time, fee for service basis. Candidates must be professionals who have experience working with people with special needs, knowledge of the adult service system in Massachusetts and a commitment to the Mission and Guiding Principles of the organization. Guardians are special people who are honest, patient and mature. Guardians provide vital advocacy services through active support, material decision-making and the protection of individual rights and entitlements. Guardians ensure that the needs of the people served are understood and addressed. Guardians make a commitment to preserve the legal and human rights of individuals who are unable to make informed decisions about independent living, legal, medical and/or financial matters. Guardians care about the well being of the people they represent. For more information on how to apply for this position, click here. Volunteer and express your "Passion For What's Possible"
Become a part of our team. 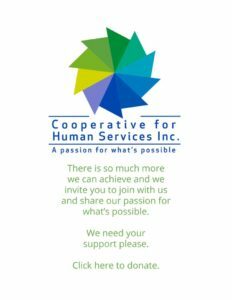 Donate to help fund our services and keep our passion alive. Site designed and maintained by 1-Stop Design Shop.